10541 ft (3213 m) . 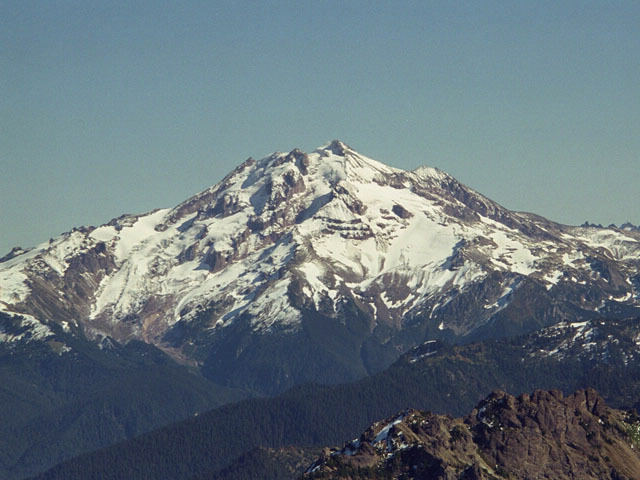 Glacier Peak is the only true wilderness volcano in the Cascade Range. 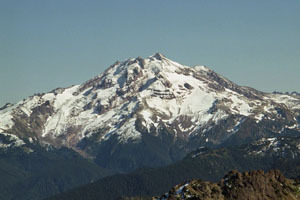 Unlike the other volcanoes, Glacier Peak has no roads reaching its flanks, and access to its base from any direction involves a hike of several miles. The heavy snowfall of the North Cascades feeds a dozen glaciers which flow from its summit cone in all directions into deep river valleys below. The shortest climbing route follows the White Chuck River Trail for 5 miles and then ascends the fairly inactive Sitkum Glacier along the western flank. This route provides a rare opportunity for solitude on a moderate route on a volcano. (50 km) Easiest, crevasse-free summit route follows the south ridge. Long 12 mile approach trail, sharing the first 7 miles with the Sitkum approach. Many skiing possibilities near 6000-8000 ft level on White Chuck Glacier. Gerdine Ridge above may be snow-free by early summer, so route may need to detour east onto the edge of the Gerdine Glacier. (40 km) Steeper, heavily-crevassed glacier route on the NW side. Upper portion of route could follow left edge of Kennedy Glacier, or cross over to Vista Glacier and east side of Frostbite Ridge. Either variation may require climbing sections of steep snow and ice or rock near the crater rim at 10000 ft.
(80 km) An extremely long approach (over 20 miles of trail) leads to the largest glacier on Glacier Peak, which flows out of a breach in the summit crater down the east flank of the mountain. The upper portion of the route follows directly up the heavily crevassed glacier into the crater and on to the summit. Best done in early spring when the approach trail is still skiable. (70 km) Follow lower part of Gerdine Ridge approach, but then instead traverse east from White Chuck River drainage into Suiattle River drainage. Miles and miles of skiing on the interconnected, moderate glaciers north of the long ridgeline of the Dakobed Range. The trail out along the Suiattle is even longer than the trail coming in. Car shuttle is needed to connect back to starting point. Full page description of Sitkum Glacier route.